After National Service Frank joined with his two brothers to establish a small family business, supplying poultry to the catering trade. "We started up in a small way. We really just wanted to do our own thing, and be our own boss," he explains. "We wanted to make things happen for ourselves and our business, something that you can't necessarily do when you're an employee." From those humble beginnings, Brakes grew into a hugely successful company. By 2002, when the family sold the business and Frank retired, it had become the UK's leading supplier of foods to the catering industry, with over 9,000 employees and an annualised turnover of £1.5 billion. The firm blossomed, Frank believes, because of the family's focus on quality. "In the food industry, the quality and safety of the product is paramount," he says. "So we invested a lot of time and money to ensure that the product the customer received was the very best. Our name was on the box, so it was not only the company's reputation, but also our personal pride at stake." Naturally, that dedication to providing the very best was backed by a great deal of hard work. "When we started we needed to get some capital into the business," Frank recalls. "My brothers and I did two men's work and took half a man's pay. We had a very strong determination to succeed. When people ask what motivated us in those early years, I always say it was the pressure to pay last month's bills!" Without any formal business training, Frank and his brothers relied on common sense. When asked what advice he would give to others starting up in business, Frank is very clear. "Attention to detail. It's easily said, but the detail is where the hard work is. When you're going into a business, you need to understand it the whole way through and ensure that all the little things are working properly. Attention to detail gives you a solid foundation." For Frank personally, maintaining that attention to detail meant planning the whole year's work and travel plans in advance to make best use of his time. "I would travel to depots around the country and the staff would know the dates far in advance. The depot managers would plan their holidays around my visits and in return, I always ensured I kept to my schedule, never cancelling a visit. My time was always fully occupied, so I could be as productive as possible." From a customer's perspective, this attention to detail was nowhere more apparent than in Brake's world-class delivery system. "We set up a tremendous service which other firms couldn't and hadn't ever done before," Frank explains. "We'd take orders 'till 4.30pm for delivery the next day. We had excellent systems that allowed us to process the order and have it ready to go out at 5am, often delivering to customers as early as 7am. We were able to fulfil 99.9 per cent of orders this way." All that hard work paid dividends over the years, and when Frank retired as chairman of Brakes, he was able to look back on his career with a sense of achievement. "The business was successful, and people enjoyed working there. That's probably the thing that gives me greatest satisfaction – so many people have told me how proud they were to have worked at Brakes, and how much they enjoyed working in an environment that supported them to be productive in their roles." Now that he's retired, Frank continues to keep himself busy. An active member of the local Rotary Club, he's also still working on improving his tennis – something which has always been a priority for him. Even in the Brakes days, no matter how busy his schedule, he would always plan to be at home in Kent on a Thursday evening to play his regular tennis match. "It's a little different now," Frank says with a smile. "I used to have to play in the winter in the dark, but it is nice to know now that on a Monday morning at 10 I have men's doubles followed by lunch. That's one of the joys of being retired." When Frank got back in touch with LSBU, he heard about the financial obstacles many young people face when trying to further their career as postgraduate level. Frank decided that he wanted to help, so now Frank Brake Scholarships are awarded to four students a year for a three year period on the MSc Food Safety and Control courses. There are students who might not be able to study because of financial constraints and so the academics that run both courses are delighted with the new scholarships. 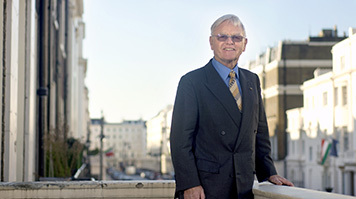 Frank said: "My life's work in building the Brake business was the pursuit of excellence. It is my hope that these scholarships will help motivate a few young people in a similar way."